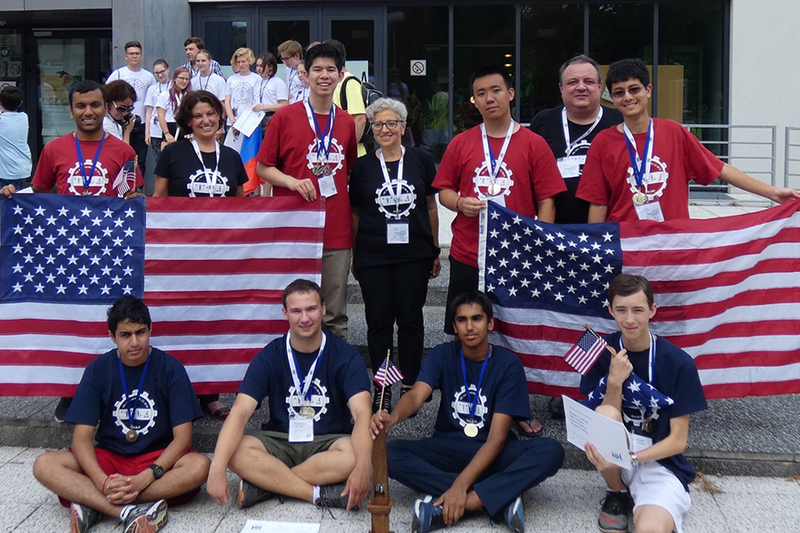 Lori Levin, research professor in the Language Technologies Institute, was a coach of the highly successful U.S. team at the 16th International Linguistics Olympiad in Prague July 26-30. Prior to leaving for Prague, the team of high school students spent three days at LTI training for the event, which involves solving problems in language analysis drawn from languages around the world. During individual competition at the Olympiad, all eight team members won medals – four gold, three silver and one bronze – while in team competition the team won gold and silver and took back the travelling trophy from the United Kingdom team. Levin's research areas include machine translation, natural language processing and computational linguistics, corpus annotation and resources. ﻿Carlee Joe-Wong is working to ground the economic foundations for the next generation of computing by harnessing devices included in the Internet of Things rather than using a centralized entity such as the cloud. Joe-Wong, an assistant professor in the Department of Electrical and Computer Engineering, has received a Faculty Early Career Development (CAREER) Award from the National Science Foundation to create an architecture for pricing usage of devices in the IoT that other innovators and companies can respond to and utilize. Some of the possible options could include: flat-fee plans that allow customers "unlimited" access or using data-capped plans that require monthly payment for a specific amount of use, such as only five GB for a monthly cellular data plan. Find out more. ﻿Joe Mertz has been selected interim director of the Information Systems program (IS) in the Dietrich College. A teaching professor in IS and the Heinz College, Mertz succeeds Randy Weinberg, who has led the program for 18 years and is retiring in December. “I am delighted that Joe has agreed to lead IS. He brings great energy and skill to IS, and his work on sending students overseas to consult for small governments or non-profits is genuinely transformative,” said Richard Scheines, dean of the Dietrich College. “We are combining forces with Heinz College to re-think undergraduate IS as a joint program involving both colleges, and Joe is the perfect choice to help lead that effort." Mertz joined CMU in 1988 as a graduate research assistant in the Department of Engineering and Public Policy and became a faculty member in 2002 as an associate teaching professor in the Heinz College and School of Computer Science. He joined the IS program in 2010. Learn more. ﻿Associate Professor of History Lisa Tetrault’s award-winning book, “The Myth of Seneca Falls,” was referenced in a New York Times opinion piece, "How the Suffrage Movement Betrayed Black Women.” In the book, Tetrault demonstrates that Elizabeth Cady Stanton, Susan B. Anthony, Lucretia Mott and their peers, who are credited with founding, defining and leading the women's suffrage campaign, gradually created and popularized the original story. She details how they created the legend during the second half of the 19th century in response to the movement's internal politics as well as racial politics following the Civil War. Tetrault specializes in the history of U.S. women and gender. Her research and teaching interests focus on the 19th century, the history of political economy, the history of social movements (particularly feminism), women’s health, narrativity, and the politics of memory. She received her Ph.D. from the University of Wisconsin-Madison’s Department of History. ﻿Neuroscientist Aryn Gittis was named a finalist for the Science & PINS Prize for Neuromodulation for her discovery of new therapeutic targets for Parkinson’s disease. The highly competitive prize is awarded for outstanding research from the last three years as described in a 1,500 word essay. Gittis’ essay was published in the Aug. 3 issue of Science. Gittis writes about how, while looking to understand the fundamental biology of the brain’s basal ganglia, her lab discovered a class of neurons that could be targeted and stimulated to restore movement in a mouse model for Parkinson’s disease. She is an associate professor of biological sciences and a member of the joint CMU/University of Pittsburgh Center for the Neural Basis of Cognition. Find out more. Research Professor Lori Levin (back row, center) was a coach of the highly successful U.S. team at the 16th International Linguistics Olympiad in Prague July 26-30.